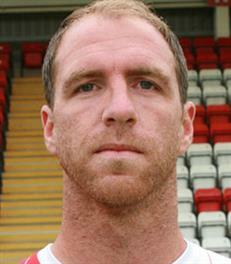 Keith Lowe originally joined the Harriers on the same day that Simon Russell left the club for York City. Lowe had previously played in a friendly game for us against Hereford Utd in pre-season but Mark Yates said that we could not accommodate him because we already had enough defenders. Lowe was released by Wolves at the end of the 07-08 season after making sixteen appearances for them in his four years at Molineux. He went out on loan on numerous occasions and it was at both Burnley and Cheltenham that he met Yates. He signed for us on one year deal but was released at the end of the season due to the financial situation at the club. He was one of the few players that we should really have kept at all costs and his release was a catastrophic decision by the club. Soon after leaving us he joined up with Adam Bartlett at Hereford Utd but after just one season at Edgar Street he was released at the end of just one season after he failed to stake a regular starting place there. He re-joined his former manager, Mark Yates, at Cheltenham at the end of June 2010 and stayed there until 2014 before joining up with York City. He left them in December 2015 due to the excessive travelling and a new born baby. In January 2016 he returned to the Harriers but left just before the start of the 2017-18 campaign after being given a new contract then told he could leave because it wasn’t worth the paper it was printed on. So he did!